SCORES of talented young soccer stars are spending their Friday nights at the Somers Town Sports Centre after signing up to take part in the first-ever Futsal League in Camden. Derived from the Portuguese futebol de salao, the five-a-side competition differs from the more traditional game as players use a smaller football with less bounce in a bid to improve creativity and technique. Organised by Fitzrovia Youth in Action, the league is proving a big hit with youngsters, who are flocking to the sports centre in Chalton Street for the chance to show off their silky skills. In the opening round of junior matches, Carlitos Barrios scored a hat-trick as early pacesetters Fitzrovia netted a 6-2 win over All Stars South. 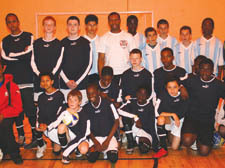 Playing back-to-back games, Fitzrovia also beat Somers Town Futsal Club 3-2 in a five-goal thriller. Stanmore netted the result of the day in their game against All Stars North. Sharp-shooter Reza Baradran scored four goals as Stanmore started their campaign with an action-packed 10-5 victory. In the adult competition, teams turned their attentions to the opening games in the League Cup. In Group ‘A’ Kickers Futsal beat Youth in Mind 5-2, while Warren Futsal Club overcame Southside 3-0. There were goals galore in Group ‘B’, with Allstars beating Wunderman 12-1 and London Brazil winning 8-3 against Fitzrovia.